It’s easy to pass by rocks and minerals while you are walking around but you never know what is lurking inside. Out in nature, most rocks and minerals may look drab and dingy because all of our different weather conditions that will wear away sharp points, dull the vibrant colors and cause cracks in the surface of the samples. Carnelian is one mineral in particular which looks rather boring on the outside because of this weathering but when you break it open to see a fresh surface, you can see vibrant orange colors and sometimes, a hidden surprise. Rain, wind, snow, ice, heat and cold all affect the nature and appearance of the Earth’s exposed rocks and minerals. Rocks that are out in the open will change the way they look due to repeated exposure to the weather over a long period of time. Hot summers and cold winters will make the rocks expand and contract which can cause cracks and flakes in the surface. The wind, rain, snow, and ice can change the color of a rock from vibrant to dull. All of these processes can also wear away crystal surfaces and change the shape of a sample as well. When you come upon a rock or mineral and want to get a good look at it, you will need to use a rock hammer (or similar item) to break the rock and collect a small piece. Look at the fresh surface that was not exposed to the weather to see the true characteristics of the rock. 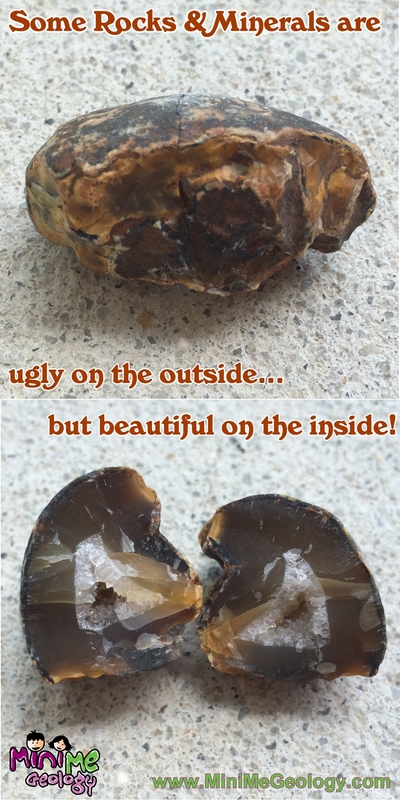 This carnelian sample is a perfect example of a mineral that looks dull and drab on the outside (top picture) due to weathering processes, but when the sample was broken, we found out that it was actually a small geode with quartz crystals lining an open space on the inside (bottom picture). Look closely at the picture on the bottom, and you can see a beautiful, orange mineral that surrounds the geode center of clear quartz crystals. Carnelian is a natural orangish-red variety of the mineral quartz but not all samples have a geode center. You can learn more about Carnelian and its properties here. So the next time you are outside, take a minute to look at the rocks and minerals around you. Just because they maybe a dull gray or brown outside, does not mean that there isn’t something fabulous inside waiting to be discovered!